On a beautiful California spring day 7 years ago while I was playing music on the Santa Monica Promenade, a life changing event transpired. A friendly, heavyset, soft-spoken gentleman approached me with a compliment about my voice. He inquired about having me sing on an upcoming kirtan CD of his, and more importantly, invited me to a weekly kirtan gathering hosted at the home of a man named Randall Reel. I had just been introduced to Kirtan no more than a week or two prior to this encounter. I was thrilled to know that I knew what he was talking about so I began attending. Here I learned many mantras, the meanings, the different deities, and, unbeknown to me, key players of what was becoming the hub of the Bhakti Movement in the West. Nobody was promoting a CD, a new book or even upcoming retreat at the time. There was simply, an opportunity to meet people in my community, while enjoying chai, a beautiful puja with Neem Karoli Baba’s (A.K.A. Maharaj-ji) image at he head, and heartfelt singing. In the early years I regularly attended Govindas, Radha and Joey Lugassy led us with our beloved MC, Shiva Baum. Later special guests showed up including Krishna Das for all of maybe 50 people. As the years rolled by, so did my bhakti journey, which led me to touring throughout Europe for the bulk of the last 7 years. This year however I made a decision to spend more time in the U.S.A. It was my first Aug./Sept. in America in 8 years and I returned for 3 festivals, ARTS, EATS and BEATS in Detroit opening from SMASH MOUTH, A new yoga/music festival outside Chicago called, SUKHAVA BODHI (Joyful Awakening), which promises to become an awesome annual mid-west event on a fantastic eco-farm retreat & sanctuary and finally the 5th annual world famous, BHAKTI FEST in Joshua Tree National Park. I was honored to be at all these events, to re-connect with old friends and make new ones. Here in the U.S.A it seems the “Business of Bhakti is Booming.” I am so grateful to the pioneers for their risks and the opportunities they are creating. In Bhakti lies a strong practice for the heart and soul so why wouldn’t America turn this into a business? Aren’t we selling just about everything else? Why not a healthy meditation practice that creates strong community building? I have often heard ”kirtan should be free or by donation” but what landlord and what airline is accepting a pay what you want policy? How can we the musicians traveling the world on a mission to bring more peace, build a bigger community this way? That being said, after my first Fabulous Bhakti Fest West Experience, filled with the necessary commerce, collaboration, marketing, and promotion to make this incredible experience possible, I craved a simple kirtan at Randall’s house again. The fact that this free tradition was still even available touched my heart deeply. 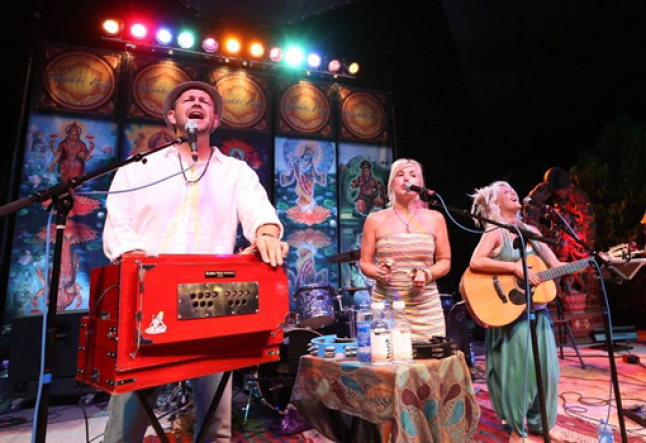 Randall has been generously offering his home, and now a newer and even more magnificent one designed with the weekly kirtan event in mind for ten years. This week’s kirtan was a small turnout in comparison to the 50 -60 (-100) that typically show up, and was exactly what I wanted. It all came back to the music, the sweet and spicy chai, and the people. It reminded me of the essence of Bhakti and why it pulled my heartstrings all those years ago and has me wanting to madly share it. I applaud and thank you, Randall. Those bhakti yogis traveling to L.A. you may want to consider putting it on your To Do List right after your visit to the Pacific Ocean.